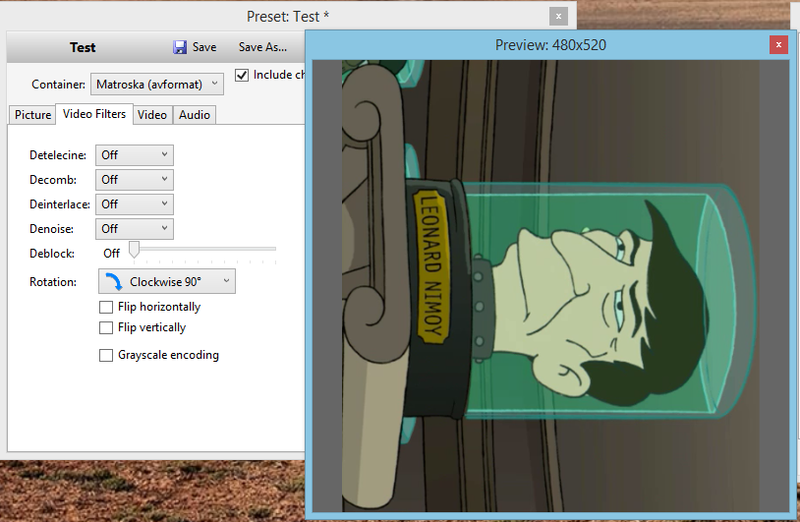 I'd like to use HandBrake to compress some video that was taken via a camera that was mounted upside down. I found a reference to a command-line rotate option, but I can't find it in the GUI. On the Extra Options under Video tab put , --rotate=4 to rotate clockwise by 90 or , --rotate=7 for 90 counterclockwise. Note: It will not work without the preceding comma and space. with success. No luck getting this to work from the GUI. a value of 1 flips on X, 2 flips on Y, and 3 flips on X and Y. "3" is said to be default and as such should do no rotation at all. I've found this to be true. The management of the ROTATE option is chaotic. It mixes FLIP and ROTATE! HandBrake (or at least the GUI) does not offer a way to rotate video. The HandBrake CLI does have a "rotate" option, however I found it is not a true rotation. Rather, it simply flips on an axis. The documentation is poor, but I found that a value of 1 flips on X, 2 flips on Y, and 3 flips on X and Y. So using a value of 3 is the same as doing a 180° rotation, which is useful for videos that are upside down, but not for videos that are sideways. mencoder can do proper rotation. While this refers to a Mac OS-X platform, I guess it should work for you too. Find a mencoder binary for your platform. Fill disclosure: VidCoder author here. into the box in the Video tab under Optimise Video: Extra Options box. It worked and flipped my video on the XY axis (180 degree rotation). No leading or trailing comma, space, etc. Not the answer you're looking for? Browse other questions tagged video handbrake video-encoding or ask your own question. What video codec should I use? Handbrake: How to retain sharpness when down-sampling video during an encode? How can I find the movie name with HandBrake CLI? How to rotate a video and have it playable on a TV set?